Right now you can catch the R-rated comedy Bad Words in limited release, and the comedy from first-time director Jason Bateman (who also stars in the film) will hit more theaters this weekend. To keep the hype machine rolling, the "Arrested Development" and Horrible Bosses star just unveiled a cool new illustrated poster that was created with the help of users on Reddit. Bateman asked people to list their top filthy words, and he picked 20 to include on the limited edition piece. So the poster is pretty raunchy, at least in language, so be wary if you don't like certain vulgar words, and some not-so-vulgar as well. Look! 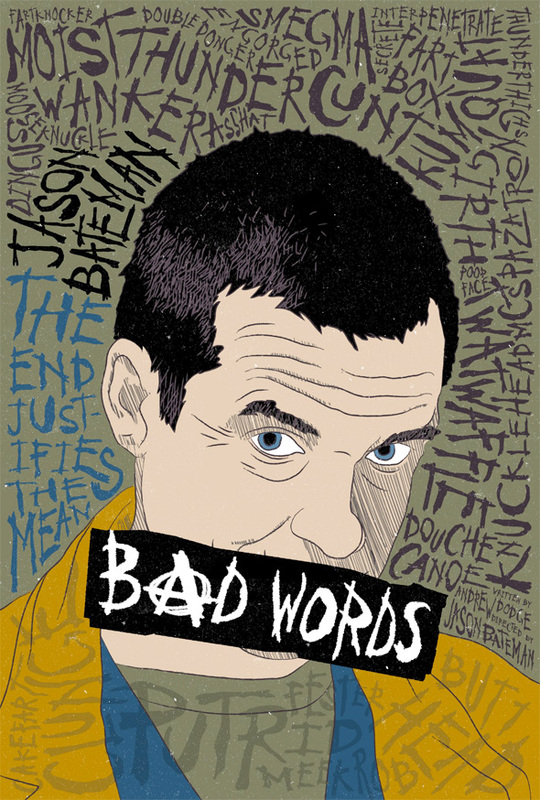 Bad Words is directed by Jason Bateman with a script from freshman writer Andrew Dodge. Thanks to a registration loophole, Guy Trilby (Bateman), a 41-year-old, foul-mouthed, cranky, ill-mannered high-school dropout, enters the National Quill Spelling Bee, and he is ruthlessly determined to win. Trilby slashes and burns through the regionals, then, at the national level, he meets legitimate competitor Chaitanya (Rohan Chand), a seemingly ingenuous boy unfazed by the older man's misanthropic demeanor. Kathryn Hahn and Alison Janney also star in the film which Focus Features released to limited theaters on March 14th, 2014.